The best real money casinos stock dozens of online blackjack variants, ranging from traditional Vegas-style games to quirky, modern variants with unique rules and special bonus payouts. We have scoured our top-ranked blackjack sites to bring you the best of the best in terms of value, authenticity and overall quality. At Best Online Casinos Australia, we only recommend iGaming sites that meet the highest industry benchmarks for quality, security and customer service. Each of our trusted real money casinos is licensed by a recognised gambling regulatory body, runs certified bank-standard SSL (Secure Socket Layer) data encryptions, and offers safe, high-quality 21 games from eCOGRA-approved software brands such as Betsoft, Microgaming and Net Entertainment. Most importantly, they all accept Australian players. If value for money is your absolute top priority, Classic Blackjack Gold is a must-play. As with most European and Australian blackjack games, the dealer takes no hole and thus does not check for a natural 21 after the initial deal. While that rule favours the house, others – most notably the single deck and the ability to hit split Aces – turn the advantage back towards the player. With correct basic strategy, the house edge in Classic Blackjack is only 0.13 per cent – far lower than in any game at a land-based Australian casino. That figure comes down even further (0.09 per cent) with perfect composition-based strategy. Combine those odds with the top-notch graphics and gameplay that are synonymous with the Microgaming Gold Series, and you have what is probably the best real money blackjack game on the World Wide Web. Live dealer blackjack is much like playing at any land-based casino, except you don’t need to trek into the city and waste your bankroll on cab fare and overpriced refreshments. Games are dealt by hand and streamed in real time to your computer or mobile device, meaning you get both the authentic, intimate feel of traditional blackjack and the myriad benefits of playing online. Nobody does live blackjack better than Evolution Gaming, which runs more than a dozen unique tables from its dedicated casino studios in Belgium, Latvia and Malta. These games all feature first-class HD video streams with multiple camera options and betting displays, so you can tailor the visual layout to suit your eye. The live chat function allows players to interact with fellow punters and with Evolution’s professionally trained dealers, while multi-platform optimisation means you can play mobile blackjack on the go via iPhone, iPad, or any Android device. While the Evolution Gaming blackjack selection caters to all types of players, it affords special consideration for the high rollers. Customers at our top live dealer casinos can choose from as many as eight different high stakes blackjack games, including Blackjack Fortune VIP, Blackjack Platinum VIP and Blackjack Grand VIP. Not only do these tables accept bets up to $5000 per hand, and sometimes beyond, they also feature liberal doubling rules for a house edge of well under 0.50 per cent. Whether it’s online pokies, real money blackjack, or live dealer casino games, few can match Net Entertainment when it comes to visual quality, game performance and special features. 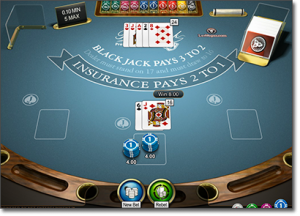 The Blackjack Pro Series games are no different, offering an immersive and intimate feel not often found in virtual casino games. Aesthetics aside, the game plays as well as any digital 21 variant on the market. It uses common American blackjack rules, with four decks in play, a dealer hole card and doubling allowed on any starting hand, although there are no resplits allowed. Basic strategy produces a house edge of around 0.40 per cent, which is about a third lower than the best blackjack game available at Crown, The Star, or any other Aussie casino. The highlight of Blackjack Pro is its flexible betting limits. Most NetEnt casinos give you three options: $0.10-$10 for those with limited budgets; $1-$100 for anyone from the raw beginner to the seasoned veteran; and $10-$1000 for the serious punter with the bankroll to match. A few sites go higher still, offering bet limits up to $10,000 for the true VIP blackjack players out there. 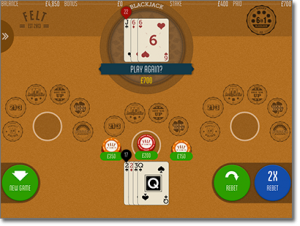 Rather than trying to mimic the aesthetics and atmosphere of a brick-and-mortar casino, Felt’s premium online 21 games embrace the digital medium with a super-smooth gameplay interface that is at once streamlined, detailed and highly appealing. For looks alone, there’s nothing to fault. Now, we don’t normally condone playing side wagers, but punters who are happy to take on some extra risk in search of bigger rewards should look no further than 6 in 1 Blackjack. It features not one, not two, but six of the most popular blackjack side bets: 21 + 3, Buster Blackjack, Lucky Ladies, Lucky Lucky, Perfect Pairs and Suit ‘Em Up. You can play as few or as many of those additional prop wagers as you like, with payouts up to 2000 to 1 on offer. What we love about Felt 6 in 1 Blackjack is that the base game is a belter in its own right. If you ignore the sucker bets (which is what all side wagers are) and stick to basic blackjack strategy, the house edge comes in at around 0.37 per cent – right up there with the very best real money 21 games on the ‘net. Most real money blackjack games deviate only slightly from one and another in terms of rules and payouts. There are a few notable exceptions, however, and this is one of them. Spanish Blackjack is the American equivalent of Australian pontoon. 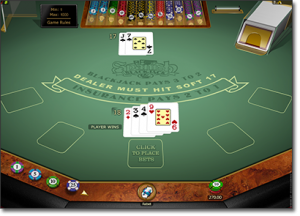 All the 10-spot cards are removed from the deck, which makes it harder to draw a natural blackjack, but this is counterbalanced by a number of unique rules that favour the player. Few other forms of online 21 will let you double down on any number of cards, or twice on the one hand, or surrender after doubling down, nor will they allow you to split up to four hands while also having the option to resplit Aces and draw to split Aces. There is no side bet required to qualify for bonus wins, which keeps the house edge to a very respectable 0.38 per cent when using Spanish 21 basic strategy.